Video and film making is a fast paced industry. With tight deadlines and strict schedules for pre-production, location shooting, and post-production, it’s all too easy to forget about your subtitles. At Capital Captions, we regularly encounter requests for urgent subtitling services. In fact, it’s very rare that clients come to us without demands on fast turnaround transcriptions, translations and subtitle burning. We offer some of the fastest turnaround times in the industry (without relying on automation and voice recognition). Whilst we are happy to supply expedited captioning services, urgency often comes at a price. For this reason, we’re here with some simple tips to both speed up the subtitling process and keep costs down. So in this blog, we’ll look at urgent subtitling services and some top time saving tips. Within the subtitling process, video transcription can take a significant amount of time. On average, it takes a qualified, experienced typist 3-4 minutes to transcribe every minute of audio. 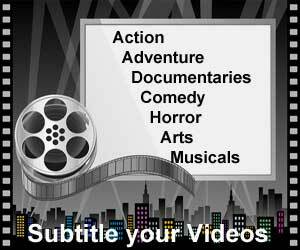 Are you looking to save a lot of time on subtitling your film or series? If so, consider sending a script with your subtitling request. A subtitling company will typically be able to lower captioning costs if they already have a script to work with. Eliminating transcription also means turnaround times can be up to twice as fast. In addition, nobody knows your script better than you. A pre-written script will ensure no mishears or unclears are present in your subtitles, which can potentially take time to correct. When it comes to subtitle translation, film translation or indeed, any kind of translation services, fast turnarounds can be hard to come by. Most foreign subtitling companies will work with their own standard templates for subtitle translation. Templates help to keep the subtitling process ‘Lean’ – maximising customer value and minimising waste. Subtitle translation templates allow subtitlers to export closed captions in the source language and receive back translations that are easily importable and stick to similar time frames, character limits, line breaks, etc. Working in this way means foreign subtitles can be created more quickly and for less money. It’s also important to understand subtitles should not be translated in the same way as documents or direct video translations. Linguists should work line by line and aim to keep the caption structures as similar as possible to help maintain audio visual sync. Editing with a professional subtitling template takes less time, with better results. When sending your video files to your chosen subtitling or closed captioning company, it’s crucial to understand what format is best for your needs. Having a video that is low res and not a final cut may be ideal for working on an urgent SRT file, but if you require subtitle burning, a high res version would be preferable. See below for some tips on the best resolutions for working with urgent subtitling services for your videos. Urgent SRT Subtitling. For speedy upload and download of your video file for SRT subtitles, a low res version would be suitable. High res videos are also fine, but remember, if you are on a tight deadline, slow downloads are not your friend! Fast Turnarounds on Broadcast Subtitling. Broadcast closed captions and subtitles include information on resolution and work to very specific guidelines around shot changes and frame rates. When working with broadcast, it’s essential to have a final cut of your video when working with subtitles. Urgent Subtitle Burning Services. Subtitle burning is the process of rendering subtitles onto your video as a permanent image. If you would like to burn subtitles into your video, your subtitling company will require a high res final cut. This means a copy of your film which is the version you are happy to have distributed. Whilst it may be tempting to send uncompressed videos from the grade, this isn’t advisable if you are looking for a quick turnaround time. Large video files (anything over 5GB) can take a long time to download, upload and render. In addition, charges for burning video from the grade is often higher as it is overall far more time consuming. So if you want to save yourself time and money, work with reasonably sized final cuts ready for distribution. So that’s it, our top tips on saving both time and money working with urgent subtitling services. If you would like more information on subtitles, feel free to check out our information pages on the site. Alternatively, contact us today for your urgent subtitling services quote.